Soma Ribek is celebrated as an expression of gratitude to the Creator in the manifestation as Sang Hyang Trimerta (Tri Mertha) for the abundant grace of food and beverages. The ceremony is held two days after Saraswati, precisely on Monday or Soma Pon wuku Sinta and held every 210 days (6 months in Bali Calendar). Soma Ribek comes from the word "soma" means Monday and "ribek" means full or rich. So it roughly means the full Monday or rich Monday. This celebration contains a philosophy that food is one of the important elements in life and must be kept in order for this blessing to continue. In addition, it also taught to use knowledge and essence of philosophy as to meet the food needs for personal, family, and wider community environment (self-sufficiency in food). Maintaining food sources will prevent us from the risk of food crisis. Mentioned in Lontar Sundarigama, the offerings is made on this day such as: nyahnyah, geti-geti geringsing, raka-raka, etc. These offerings will be placed in Pulu (where rice is stored), the rice barn (Jineng/Klumpu), and other container to store rice. On this day Balinese also performed some restrictions such as: no pounding rice, no selling rice, and no napping. This is done in honor and as an expression of gratitude to Dewi Sri as the goddess of prosperity, conferring the fertility of agricultural land. 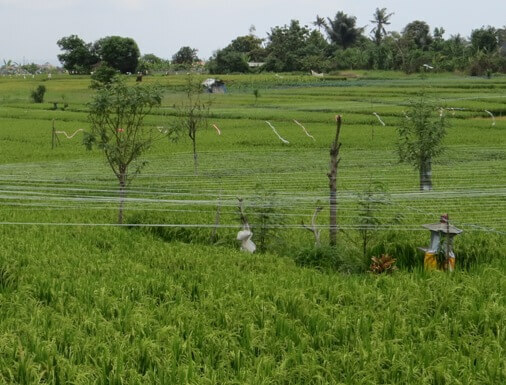 Agrarian culture is inherent in the life of Balinese people. Balinese believes in the glory of Goddess Sri who has conferred fertility on rice crops so that create abundant harvest and full rice barns, as a symbol of prosperity and sustenance. The Goddess Sri is usually associated with rice, fertility, successful harvest, and family prosperity and harmony.